Cocoa butter (also known as cacao butter) provides antioxidants that act synergistically to present a massive offensive against free radicals that can destroy skin cells and lead to premature aging. Pure cocoa butter aids in the prevention of skin degradation caused by the harmful effects of UV radiation from the sun and is great for soothing painful sunburn. Cocoa Butter contains minerals: including calcium, potassium, magnesium, zinc, manganese, copper and iron, all of which are in a highly bioavailable form. Used alone, there are few natural skin care products better than cocoa butter. Shea Butter used for generations in African cultures, is a renowned moisturizer, health aid, and healing balm. It can turn almost any dry skin patch into a smooth and supple surface without a sticky or greasy feeling. 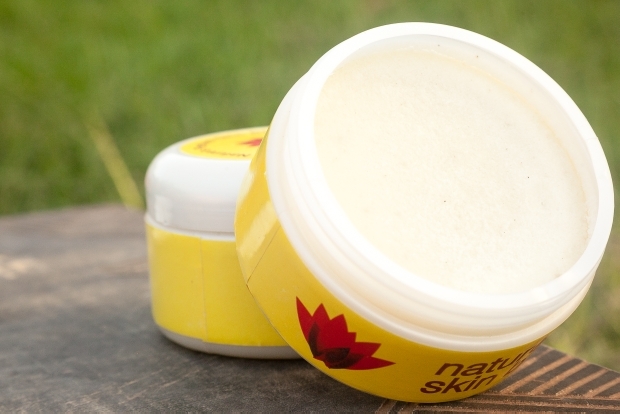 Shea Butter is a fantastic moisturizer for the outdoor enthusiast suffering from chapped and cracked skin. It has a high level of cinnamic acid, which is a naturally occurring sun screen; easily absorbed into the skin and pores without clogging. Used alone, pure Shea Butter is a great choice for a weekly, if not daily, moisturizer. Coconut Oil heals, protects, and beautifies skin. The small molecular structure of coconut oil allows for easy absorption. The oil penetrates into the deeper layers of skin strengthening the underlying tissues. Coconut Oil aids in the reduction of chronic skin inflammation and can be soothing and healing to wounds, blood blisters, and rashes. Used alone, Coconut Oil feeds unhealthy skin and makes it more evenly textured with a healthy glow. Lavender Oil is the most used essential oil in the world today, but the benefits of lavender were actually discovered over 2,500 years ago. It’s been used both cosmetically and therapeutically for centuries. Lavender Oil is a natural antibiotic, antiseptic, and detoxifier which promotes healing and prevents scarring. Lavender Oil helps clear acne, athlete’s foot, eczema, and psoriasis. The therapeutic grade lavender essential oil used in PSB is sourced from the US, but the country of origin may vary. The rays of the sun gently blend 3 ingredients for unscented PSB: Coco butter, shea butter and coconut oil. Lavender essential oil, the only fragrance used in our scented PSB, is added after the sun finishes its work. The solar blending process leaves a ZERO carbon footprint. Because nature determines the outcome of each batch of PSB, batch consistency can vary, but the results are consistently FANTASTIC! Our small batches of psb are meticulously hand processed with pride in Ghana, West Africa. Warm greetings everyone. I’m Ron, the creator of Nature’s Perfect Skin Blend (PSB). My journey to the creation of PSB is tied to an actual journey to Africa. When neither I nor my wife was of retirement age, we decided to leave corporate America and move from the US to Ghana, West Africa. For me the move fulfilled a commitment to a long standing dream of making a living while making a contribution to the health of the planet. Must admit, I was also tired of US winters. My dear wife enthusiastically supported the move, as life for her is a never-ending adventure. We arrived in Ghana prepared to fulfill my dream by marketing solar cookers in a country with plenty of sunshine and a deforestation problem. Solar cookers would help reduce stress on the forests by reducing the use of charcoal and firewood, the main cooking fuels for most Ghanaians. Solar cooker users would also save money cooking with the free rays of the sun. I was convinced the chosen cooker was the right product for the right country. My supportive as well as practical wife, declared soon after our move, “This is an observation; not a criticism: The solar cooker idea is not going to work!” Took me a while to concede that she was right. The solar cooker I had in mind for Ghana was a Mercedes Benz, and we’d moved to a Studebaker market. Most Ghanaians couldn’t afford the solar oven - even at a wholesale price. Once it became depressingly clear that the solar oven idea wasn’t going to work, coming up with a plan B was necessary and turned out not to be as challenging as we expected. After learning about cocoa butter in high school, I’d invested several years researching and developing a cocoa butter mixture for my personal protection against skin- damaging harsh winters and the intense UV rays of summer. Adapting that original US mixture for a variety of skin types became a natural Plan B. Deciding to perfect the cocoa butter recipe was easy. The work of perfecting the recipe was time consuming. Years of test marketing cocoa butter formulations and gifting them, in exchange for honest feedback, to Ghanaians and to US friends and acquaintances each time I visited the States, resulted in countless ingredient adjustments. Eventually, after numerous modifications, one formula consistently received positive feedback from everyone who tried it on their skin or hair. Thus, Perfect Skin Blend was born out of people affirming that it worked perfectly for them. Friends: Though the move to Ghana didn’t follow the expected course, the outcome is more satisfying than anticipated. PSB is a healing skin cream made of natural butters and oils blended with love and without discharging a single molecule of CO2 into the atmosphere. PSB enables me to make a contribution to the health of the planet using the solar cookers my wife thought wouldn’t work! Please give PSB a try. We are confident you will agree that it is a wonderful product. We foster relationships with local farmers who share our values and practice sustainable agriculture.